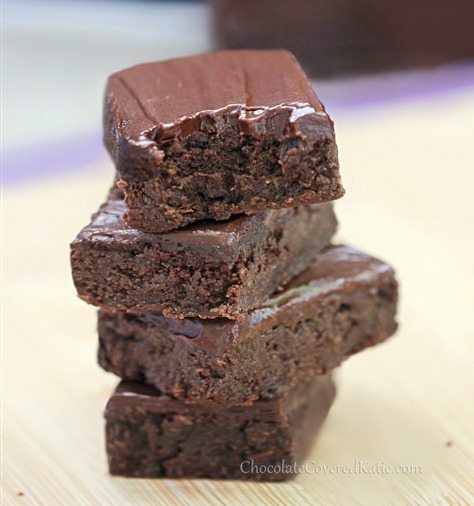 Zucchini Brownies - They're Secretly GOOD For You! 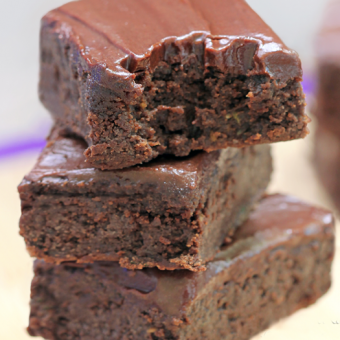 Home » Zucchini Brownies – Secretly GOOD For You! Zucchini Brownies – Secretly GOOD For You! Zucchini brownies that are vegan, gluten free, grain free, and flourless, with both paleo and keto options as well! But most importantly, they just taste really, ridiculously good. 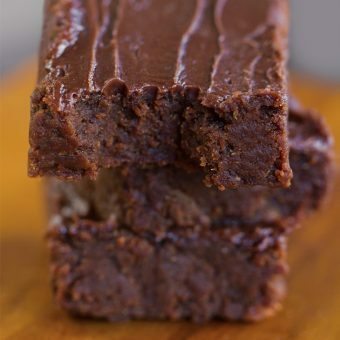 If you want to make the zucchini brownies keto-friendly, just sub yogurt– such as coconutmilk yogurt–for the applesauce. Be sure to use the flour listed in the recipe, as I haven’t tried it with any others and coconut flour generally can not be substituted for regular flour in a 1-to-1 ratio when baking, because it is actually not really flour at all! 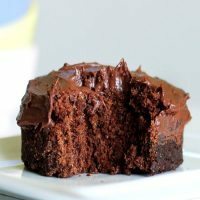 There’s a frosting recipe included in the recipe, or you can choose to frost them with my recipe for Chocolate Frosting Shots. But once the zucchini brownies meet me, they will quickly disappear, as if by magic. That’s what happens when you leave me alone in a room of brownies. This zucchini brownie recipe has quickly become one of my personal favorite recipes on the entire blog – and it’s a huge reader favorite as well! They are soft and moist and oh-so fudgy… You will fall in LOVE! Recipe for zucchini brownies: Preheat oven to 350F, and line a 9×13 baking dish with parchment paper. Set aside. In a large mixing bowl, whisk together the first 6 ingredients and let sit at least 5 minutes. (Tip: shred zucchini in a food processor for fine shreds.) 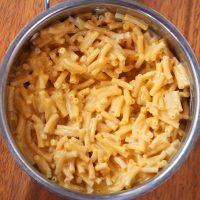 Combine all other ingredients in a separate bowl, and stir very well. Pour wet into dry, stir until evenly mixed, then pour into the baking dish. Using a full sheet of parchment or wax paper, press down very firmly until the brownie batter evenly covers the pan. Bake 19-20 minutes, then pat down hard with a pancake spatula or another sheet of parchment. (If still undercooked, it’s fine. Just fridge overnight and they’ll firm up!) Let zucchini brownies sit 15 minutes before trying to cut into squares, and if at all possible wait until the next day to eat them. They will be twice as flavorful! Tip: as a general rule, cutting brownies with a plastic knife prevents crumbling. Makes 20-24 squares. Mix frosting ingredients together to form a sauce. 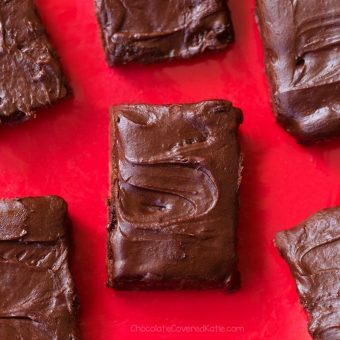 Spread sauce over the zucchini brownies, then fridge or freeze 10-20 minutes and the sauce magically transforms into fudgey chocolate frosting! 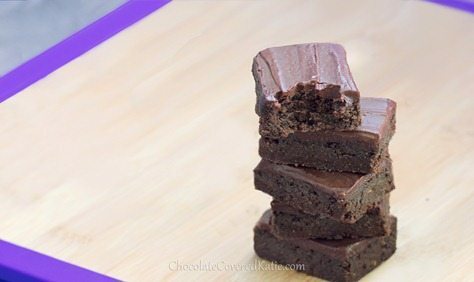 These brownies taste much richer the next day, after the flavors have had a chance to intensify. Due to the melty nature of the frosting, frosted brownies are best stored in the fridge or freezer (they thaw well). 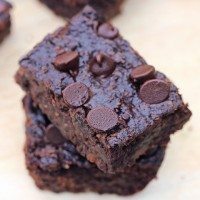 These healthy brownies are high in fiber and Vitamin C, cholesterol-free, gluten-free, vegan, low in sugar (or sugar-free), and they even offer Omega 3s! Katie, these look amazing! And you are absolutely gorgeous! 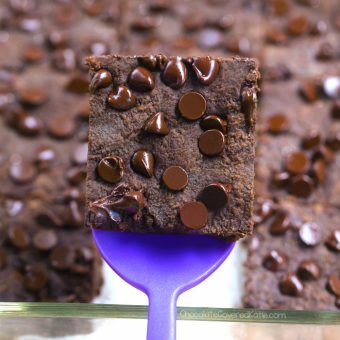 Brownies are by far by favorite dessert so I love when you post healthier versions of them! Does anyone know where to get flax meal? Is flax meal the same as flax seed? Yes it’s the same as the seeds, but it’s ground. So look at most grocery stores for either flaxmeal or ground flax. Or ask if they carry it. Most do, even walmart and target. I have flax seeds seeds and just grind them myself in my ninja using the single cup with the blade. Does anyone know if I could substitute ground chia seeds for the ground flax seeds? Thx. I don’t see why not! Be sure to report back if you do! Flax seed is not the same as flax meal. It’s flax seeds grounded. Bob mills brand is sold now at most Walmarts and grocery stores.And of course online. 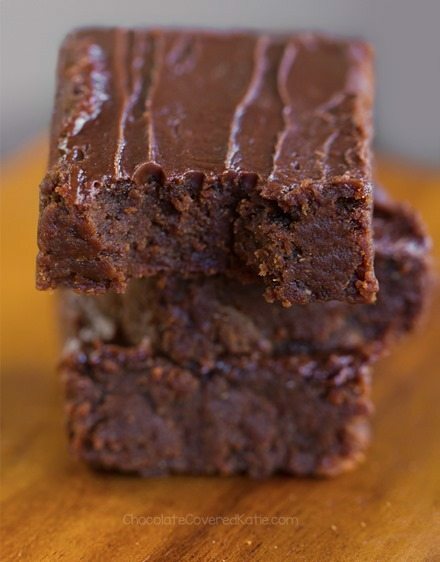 Awesomeness in the form of a zucchini brownie! These look amazing! You rock, Katie! 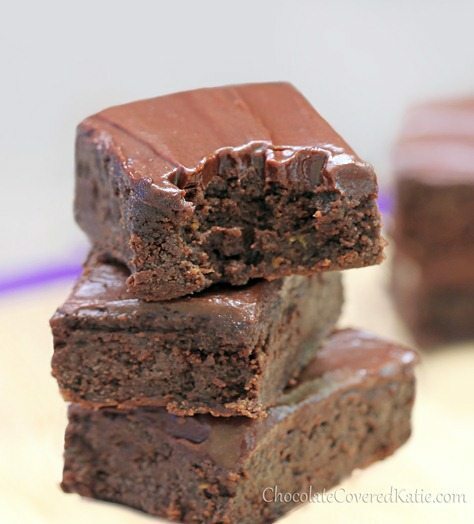 I have been searching for a fudgie brownie recipe and the fact that this has zucchini in it as well is just the icing on the cake so to speak. And btw Katie you DO look beautiful here! (A little different up close, actually.) And I do appreciate the single recipes when I bake small. 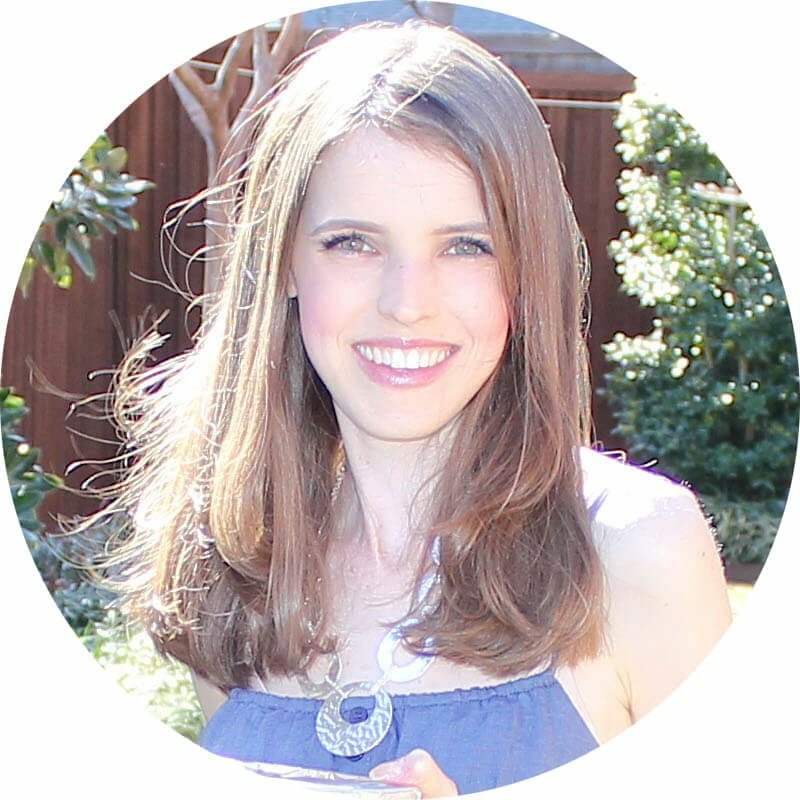 I don’t have coconut flour – can I substitute with white whole wheat? Or can I grind up some shredded coconut (unsweetened) that I have on hand and “make” coconut flour? 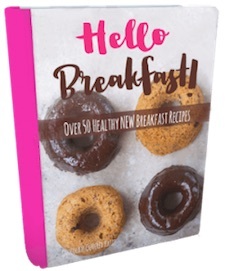 My guess is no on just subbing whole wheat flour, since Katie linked a couple other recipes that use regular flour… they don’t behave the same way since coconut flour is gluten-free. You could always try it (maybe leave out the flaxmeal, since I think that’s the binding agent? ), but you might be better off using a different brownie recipe. No idea how you make coconut flour! FYI-I subbed whole wheat flour for the coconut and they came out just fine. Super scrumptious!!! Thanks for sharing!!! I dont have coconut flour so this will help a ton! thank you ssooo much for this i was really counting on making these so reading your comment saved me life! 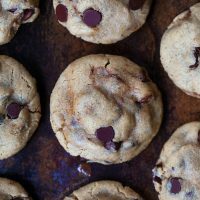 How did your recipe sans coconut flour work? Curious to know as i too wish to try it with whole wheat flour. I love these. I also used ground whole wheat.I used fresh zucchini, with peelingstill on it, and Apple’s instead of the sauce. (From the garden and trees out back). We’ve had so many Apple pies. So, nice change. Didn’t use the ? syrup, instead plumped raisins. I froze the extra batter for another day. WOW. I’m surprised that it would turn out fine with wheat flour in place of coconut> Did you decrease the water, or increase the flour? I’ve always read that coconut flour requires a lot more wet ingredients than wheat flours. 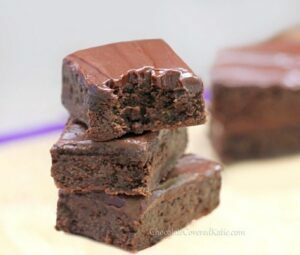 I haven’t made these brownies yet, but am planning to–a rating was required to post a comment, so, I’ve based my rating on my prior experiences with CCK recipes and my prediction of how good these will be. I love zucchini brownies and I really love making my friends guess the “secret” ingredient. Excited to have a new version to try! I can barely stand how cute you are, Katie. What a doll. 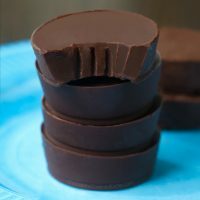 These look so fudgy and delicious!! Hi Katie, can you please tell me what I can substitute the flax meal for? I don’t have any and am wanting to make this right now. 🙂 Looks delicious! Katie~I’ve never seen coconut flour. Help! Google is your friend, lol. 😉 You might be able to find it at a local health-food store, but lots of places online, too. Otherwise, just try one of her other brownie recipes that use regular flour. 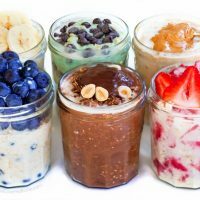 They look like the perfect post-workout snack! Your hair is absolutely fabulous! Are those curls natural? I spent just about a minute curling just the ends up with a curling iron. Normally, my hair is pretty straight. I have ground flax – is that the same as flaxmeal? Yes I think it’s the same. 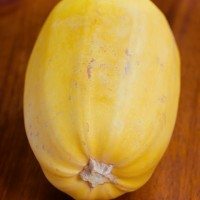 Zucchini must me in the water lately – everyone is baking with it! I have a microwave protein zucchini bread up today for the #strangebutgood link up. 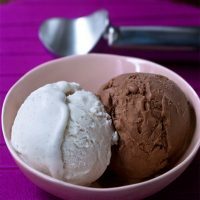 Totally going to try it with chocoalte next – great idea! 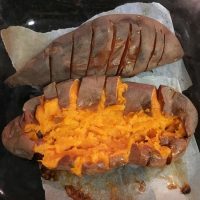 I have always had a problem adding vegetables to bake goods, looking forward to trying this recipe especially since zucchini is in season..
this looks awesome! Can you sub peanut flour or another type of coconut flour? Also– when you bite, are there shreds of zucchini or do they blend? Shred the zucchini using the recommended food processor and people who aren’t looking for it won’t even know it’s there. I don’t recommend flour substitutions, though. Hi Katie! So I really want to try your brownie recipes but one thing is nagging me. 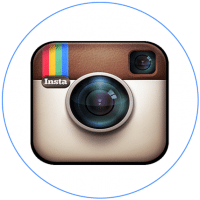 You say–in I think all of the brownie recipes–to refrigerate overnight or several hours. So do you eat the brownies cold then? Or just refrigerate them to firm them up and then let them sit at room temperature? 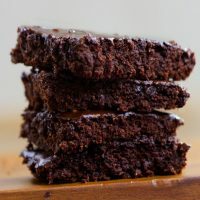 I always loved warm brownies right from the oven, which is why I’m a little hesitant to try these, as I feel like I would miss warm brownies. Do you think it makes a difference to eat them cold? Thanks! -Anna ~P.S. Loving the cookbook btw!! HI what do you think would happen if I used all stevia. You are so beautiful and so are these brownies!! !